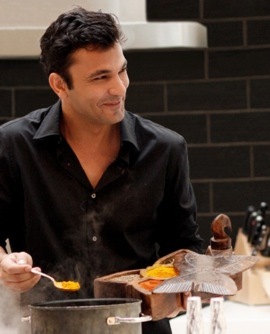 Vikas Khanna opened his own catering company at the age of seventeen and never looked back. He has worked his way up to be one of New York City’s top-rated chefs with his work at Salaam Bombay, The Café at the Rubin Museum, and the Michelin-starred Junoon. He is equally recognized for his work in humanitarian efforts with SAKIV, New York Chefs Cooking for Life, his documentary film series, Holy Kitchens, and as the host of MasterChef India television program. In recent years, he has become recognized for his television appearances on Martha Stewart, Gordon Ramsay’s Hell’s Kitchen and Kitchen Nightmares, and Throwdown with Bobby Flay. Khanna now resides in New York, NY.